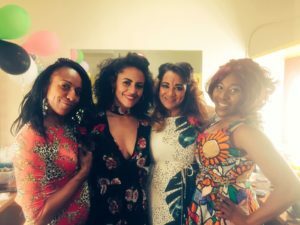 It’s our second week at the glorious (Kerry’s favourite adjective) Theatre Royal Stratford East, London… whoop whoop! We were graced with spectacular weather, packed houses and standing ovation – all in all it’s been a blast beginning with Monday’s Press Night and it was so nice to see so many familiar faces! This performance marked our 60th show of the run where Natasha Julien (Dancer) found herself being sewn into her pedal pusher jeans – this was probably why we received such a rapturous applause at the end! In true Joan Littlewood style we were all given red carnations to wear as the whole company got all dolled up to enjoy a fab party and feed in the bar afterwards, where in true Tommy tradition William (Tommy) managed to knock over a bunch of drinks and cover it up by blaming BSL Interpreter, Rose! He had a fab night though so we’ll let him off! Tuesday saw everyone up bright and early to head to Gerry’s Bar in Stratford for our London CPD workshop with Casting Director Sarah Hughes which went down really well. We sang another happy birthday to Natasha J as we didn’t do it with cake the first time (soz!) We also learned that Matthew (Voice of Tommy) uses Shekinah’s (Voice of Nora) breasts for navigation during Pinball Wizard and Donna (Nora) showed her wicked side by convincing Kirsty (Wardrobe Manager) that she had ripped her dress for the fifteenth time… she hadn’t but there’s still time! After another electric show we took part in a Q&A session in the auditorium led by Kerry (Director), Nickie (Associate Director) and Mark (Choreographer). I have found that these sessions on the Tommy Tour have been particularly insightful and have generated some genuinely interesting conversations, particularly surrounding diversity within the theatre. Following this somebody did ask Peter (Acid Queen) what he remembered from the first production of Tommy in 1979, he replied with “absolutely nothing, we were just wandering around with bottles of brandy!” I’m sure he was kidding but it was funny nonetheless! Shekinah with her feast of food! 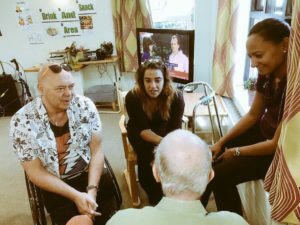 Wednesday morning was particularly busy for myself (Hawker) and Garry (Uncle Ernie) as we joined Marcus Romer (Associate Director TRSE) at Silk Court Residential Home in Tower Hamlets, one of the homes where the Saturday matinee would be live streamed to. Here we had a great time chatting with some of the residents, in particular Ron who had a ball gassing with Garry and I about the Arsenal amongst other things. It was fab to be able to see at least one of the places that the show will be screened as it went out to Social Care homes across the country. That is one of the aspects of the show that makes me particularly proud of this production, long may it continue and evolve. Following this, Gaz and I took to the sunshine where I introduced him to the legendary mac & cheese/mutton curry gravy collaboration… he was pleased! As was Shekinah when she arrived to order her large portion of mutton curry plus a portion of stewed chicken on the side… and devoured the lot!! So impressive… where does she put it?! Back in the theatre the company bundled on top of poor Max (Captain Walker) for his birthday and he was treated with a crown to wear for the day! Meanwhile Steve (Bass Guitarist/Winston Churchill) was busying himself by tickling Anthony (Rev Simpson) by blowing raspberries on his tummy in warm up… poor lad! Becky Barry stood in as Super Swing again that evening and did a marvellous job, unlike me who forgot to pick up Amelia (Specialist’s Assistant) in the bows… again…I’m still sorry Emilio, worst guide dog ever! 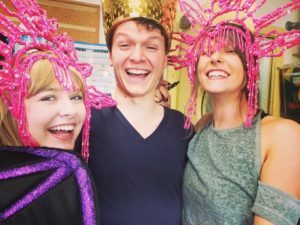 Max gets royal with the wardrobe ladies! 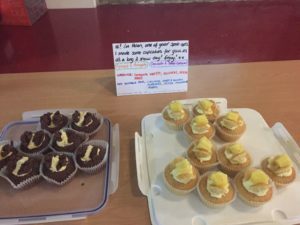 Thursday saw the return of the two show day but was made a tad easier thanks to Helen (Follow Spot) who had baked us a lovely batch of Coconut & Pineapple and Salted Caramel & Chocolate cupcakes – thank you soooo much! This matinee was our London Relaxed Performance and it was a full house. Garry did another fab job at hosting while Peter was greeted to an enthusiastic “What’s that?” as he entered the stage as the Acid Queen… absolute genius! We also had a new ASM on board with us in lovely form of Clare and Rosie jumped into prompt corner to call the show… all did a fab job! 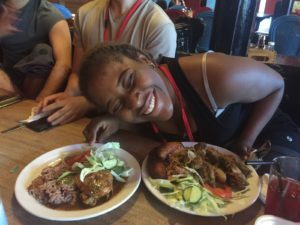 Between shows Patricia (Company Manager) was utterly deflated when she learned that the bar had run out of Ackee & Saltfish so she went on a mini mission in Stratford to seek some out. Moments later she did one better by discovering Esocovitch Fish in the indoor market… winning! The show that night was another fab one even though Matthew found himself negotiating vertical with his chair in Sensation and Donna gained a little fan in the form of Steve’s friend’s 5 year old son who saw her show programme and recognised her from the TV. She then sent her a little video message via Steve, it was very sweet! Follow Spot Helen knows how to keep the company happy! Friday night was packed to the rafters, so much so that people were being seated in the boxes and as high up as the follow spots. A full house teamed with scorching weather made the theatre not too dissimilar to a sauna but everybody had a fab time regardless, even though Hearns (Dancer) was so warm his hearing aid slid out and flew across the stage… thankfully he managed to retrieve it in one piece! It was a true rock and roll night for Stratford having The Who musical in the theatre and Guns N Roses playing across the road at the Olympic Stadium (their first time in London since 1993)… you can only imagine the traffic situation that evening! So Saturday rolled around so quickly but we were all pretty excited as the matinee was to be our first performance to be live streamed to the Social Care homes across the country as mentioned on Wednesday. Marcus and Kate Lovell were at two of the venues as it happened and said that the feedback was phenomenal and everyone had a great afternoon – perfect result, well done team! The temperature in the theatre however did continue to rise, resulting in Matthew providing 4 mini fans for the back stage area while the audience and follow spotters fanned themselves with Tommy flyers… even so, everyone stood at the end and had an absolute blast! This was probably due to the true commitment of Becky who, once noticing that the camera flash wasn’t working in the psychiatrist scene, took the initiative to say ‘flash’… a lot…… it was brilliant! Shekinah found herself so particularly hot and bothered in between shows that she went off to pack her suitcase only to fall asleep on top of it! And quote of the evening show goes to Amelia where during the interval she stated “My dress is so wet, I don’t want to put it back on!” We understand babe, just take a look at poor old drummer Adam… even his tie was saturated! 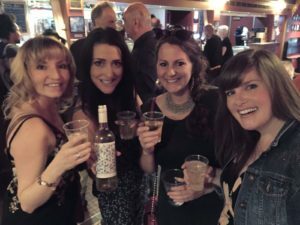 But we were all cheerful nonetheless as we bowled into the final bows at Theatre Royal Stratford East for a truly wonderful response and some yummy nibbles in the bar after… cheers again Rita! Thank you so much Stratford, it’s been so so wonderful to be back and we have had the most incredible time. We even embraced the rake on the stage! 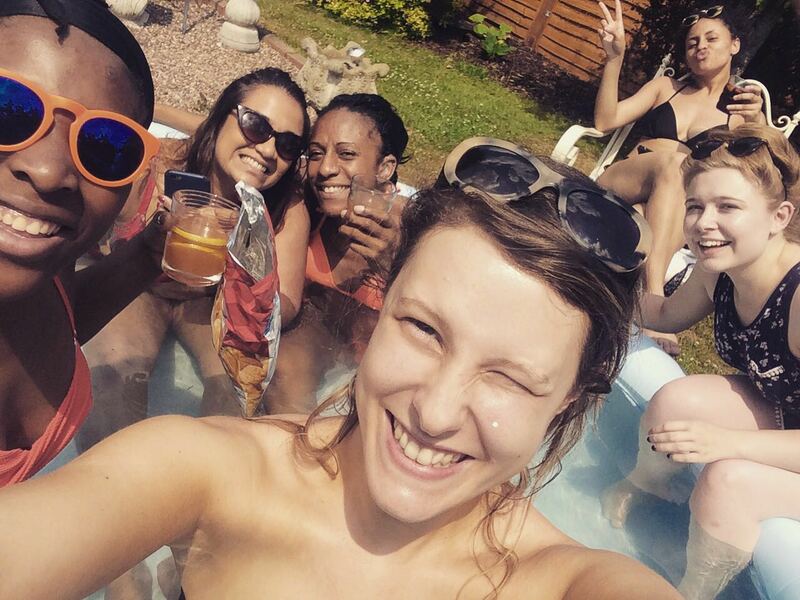 I am currently writing this from the comfort of a paddling pool in blazing sun at Steve’s house where he has treated us to an amazing weekend of food, Ribena and splashing about… a perfect roundup to a perfect fortnight! New Wolsey New Mums Alumni! Sophie, Becky, Sarah and Shirley.